Terry Bozzio has worked with world-class artists such as Frank Zappa, Jeff Beck, and Steve Vai, and Rolling Stone listed him as the fifth greatest drummer in rock. On Thursday, he stopped by Yoshi’s at the tail end of this tour which celebrates the 50th anniversary of his first drum lesson. 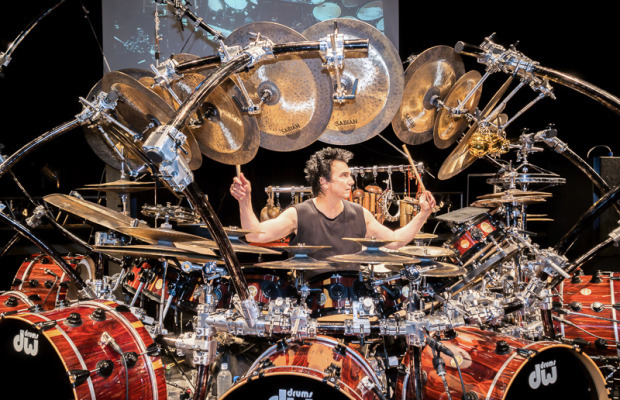 Bozzio, 63, has been traveling across North America for nearly three months now with his wife, Mayumi; and drum tech, Ben, who has the tedious job of assembling the “sculpture” (as Bozzio likes to call his behemoth melodic drum kit), at every show. The enormous structure virtually encases him with only a tiny three-foot opening to view the audience. The “sculpture” features 26 toms, two snares, eight bass drums, 53 cymbals, 22 pedals, and a whole lot more. Bozzio plays on two-and-a-half octaves of tuned tom-toms and eight notes of bass drum. There are 22 pedals that have to be fine-tuned every day so they don’t interfere with each other. If you’d like a more accurate accounting of his kit, click this link. As the show began, Bozzio climbed into his kit while playing several mini shakers that set the tone for the first song, “Africa.” The first set ran an hour and included “Flute Loops,” and a composition called “Debussy,” a piece inspired by one of his classical music heroes, Claude Debussy. This entry was posted on Saturday, October 25th, 2014 at 19:01	and posted in Review, Terry Bozzio. You can follow any responses to this entry through the RSS 2.0 feed. « Rockin’ the Wall – 25th Anniversary of the Fall of the Berlin Wall – Announcing US Theatrical Tour & DVD and Digital Release!